These three beachfront resorts, Alexandra Resort All Inclusive, Beach House All Inclusive and Blue Haven All Inclusive are all located on the exclusive island of Providenciales in sunny Turks and Caicos Islands. From the value positioned beachfront property, Alexandra Resort All Inclusive, to the 21 suite boutique property, Beach House All Inclusive on Grace Bay, and the award winning Blue Haven Resort All Inclusive situated on one of the island’s only private beaches, guests are offered a variety of accommodations, amenities and services to experience while on their vacation. At the core of these vacation choices is a passionate commitment from this Turks and Caicos All Inclusive Resort team to share their warm island hospitality and combined vast years of hospitality expertise with each and every guest. The Alexandra Resort is a 90 room, all-suite resort located directly on Providenciales’ top ranked beach and in the heart of the acclaimed Grace Bay resort community. The resort enjoys a reputation for offering the best beachfront resort value on Grace Bay, and for providing friendly service to families and couples alike.From a free daily activity program to intimate spa services at Elevate Spa, and marine excursions with Caicos Dream Tours, guests at the Alexandra Resort can enjoy convenience and a variety of vacation experiences during their stay. The Alexandra Resort is also the address for Asu on the Beach, a popular beachfront restaurant on Providenciales. Beach House is a true boutique hotel located on the tranquil west end of Grace Bay Beach designed for pampering and relaxation. This intimate 21-suite property is luxuriantly playful and wonderfully contemporary. The “rooms have no numbers” and, with a twinkle in the eye, it is stated that “no socks are allowed”.The one and two bedroom suites are well over 1,000 sq ft offering plenty of space to kick back and relax. The Beach House Restaurant – often rated one of the best restaurants on Providenciales – serves up delightful fine dining utilizing authentic Caribbean flavors and spices. The Beach House experience includes a spa offering beachfront treatments, gym, non-motorized water sports, pedal bikes and your own dedicated pampering pod on the beach. 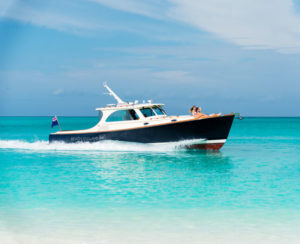 Tucked away in the upscale residential community of Leeward at the east end of Providenciales, Blue Haven Resort and Marina is one of the newest and most private resorts in Turks and Caicos.Just 35 suites and 16 guest rooms occupy a stunning waterfront property that is enhanced by a magnificent IGY superyacht marina. Witness the lifestyle of the rich and famous when yachts visit the marina, or take advantage of the resort’s close proximity to adjacent mangroves, uninhabited cays, iguana sanctuaries and the most colorful diving sites, which all offer incredible eco-adventure and excursion opportunities. At night, a pier bedecked with elegant fire pits and outdoor lounges invites happy hour indulgences and stargazing, followed by delicious meals at Fire & Ice, or the more casual Salt Bar & Grill. The recently opened Market offers a gourmet deli and grocery experience for all resort and marina guests as well as the local community. This is a luxury adventure resort like no other on Providenciales, and on par with the best boutique hotels in the Caribbean. Asu @ Alexandra Resort – After the glorious weather and incredible beaches, perhaps one of the best aspects of a vacation in Turks and Caicos is enjoying some of the fabulous dining opportunities on Providenciales. One of the best places to do that is at Asú on the Beach, a Turks and Caicos restaurant at the Alexandra Resort. Asú means sunset in Taino, the language spoken by the Arawak Indians who lived in Turks and Caicos centuries ago. The resort offers an expansive dining terrace overlooking Grace Bay Beach; the perfect venue to greet the day, enjoy a leisurely lunch and witness a magnificent sunset. Asu also offers a beach bar, service by the pool and at the beach to resort guests, a stone baked pizza oven at Asu Pizza Deck, and barefoot dining on the beach at dinner (reservations required). Beach Deck @ Beach House Turks and Caicos – No doubt when you think of Caribbean dining, a restaurant on the beach comes to mind. We know that, and it’s why there is the Beach Deck at Beach House. Leave the sand on your toes and apply a fresh layer of sunscreen when you join us for lunch. Order a tropical cocktail and then settle back to watch the view on the #1 ranked beach in the world while we prepare a fresh salad, succulent burger or flavourful local fish for you. Fire & Ice @ Blue Haven Resort – Fire & Ice is a delightful waterfront restaurant that offers a picturesque setting and a unique contemporary Mediterranean menu. Popular dishes include cataplana, a three course meal that is perfect for sharing with friends and family. The main course – seafood prepared in a copper pot – greets guests with an amazing aroma and a generous selection of lobster, shrimp, mussels and fresh fish. Another popular offering is the tabletop charcoal barbecue grills. Choose from wagyu beef flank steak, New Zealand lamb cutlets, mulard duck breast, and kurobuta pork tenderloin. Combos also available. All served with grilled vegetables and unlimited homemade french fries. Kitchen 218 @ Beach House Turks and Caicos – The Turks & Caicos dining scene has been introduced to a new interpretation of culinary excellence with Kitchen 218. In keeping with the boutique hotel accommodations experience offered at Beach House, the restaurant’s décor exhibits encourages gracious service, a tranquil dining environment and a beach casual-chic atmosphere. The open air dining terrace is located next to the picturesque swimming pool area landscaped with tropical gardens. Market & Cafe @ Blue Haven Resort – MARKET is Blue Haven Resort’s convenient on-site grocery store and cafe. It offers a selection of fresh produce, organic ingredients and products, cheeses, ready-made food and snacks, as well as wine, beer and other beverages. MARKET sells alcoholic beverages on Sunday as well as ice. Do some grocery shopping and then visit the cafe to buy a treat to be enjoyed on the shaded terrace overlooking the Leeward canals and Blue Haven water sports marina. The cafe serves Allegro brand teas and coffees, and prepares specialty beverages too. MARKET is open daily from 7am – 8pm. It is located in the Boathouse at Blue Haven Resort, adjacent to Elevate Spa. Salt Bar & Grill @ Blue Haven Resort – On any given sunny and breezy day, enjoy the view of the yachts in the Blue Haven Marina while soaking up the flavors of the Caribbean at the casual Salt Bar & Grill. Make an afternoon of it! Play some beach volleyball or horseshoes, catch a game on the big screen, or just bask in the warmth of the sun. Salt Bar & Grill is open daily for lunch and dinner, and a very popular happy hour. The best burgers and fish tacos are served at Salt! The casual bar atmosphere has become the talk of town, reminding residents of days gone by when many travelers used to arrive by boat in the Caribbean. Today, the only thing that has changed is that the boats are predominantly motor driven. What has not changed is that their occupants tell stories from all over the Caribbean about their recent marine adventures.